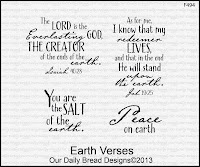 Creative Nugget: In a world that seems to be spiraling out of control, where what is right is criticized and what is wrong is exalted, I love this verse that reminds us that we are to be the salt of the earth...to impact our world in a positive way. 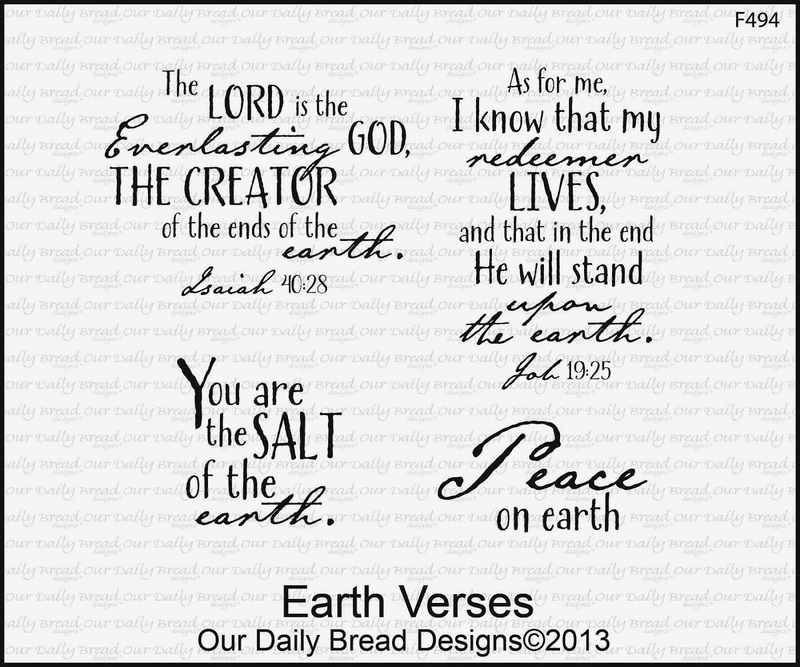 The verse reminded me of the Salted Technique which was used for the background. 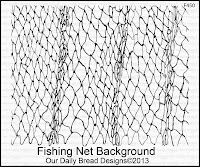 The Fishing Net Background was clear embossed on a piece of Multi Media paper. Water was spritzed on the panel and Distress Reinkers were applied with a paint brush. Course salt was then sprinkled on and spritzed again. This was dried with a heat tool and the salt rubbed off with a paper towel. I love the variations this technique achieved. 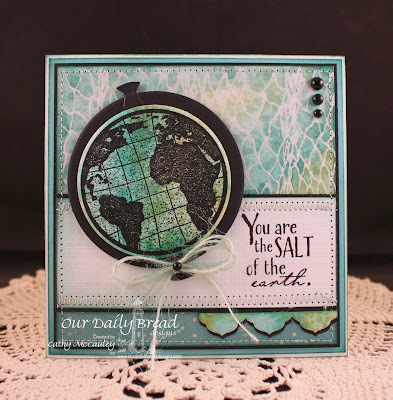 The Earth was stamped over another piece of salted background made without the embossed Fishing Net and cut with the ODBD Custom Circle Ornament Dies. The sentiment from the Earth Verses set was stamped on a piece of Solar Crest card stock and texture was added with an impression plate. 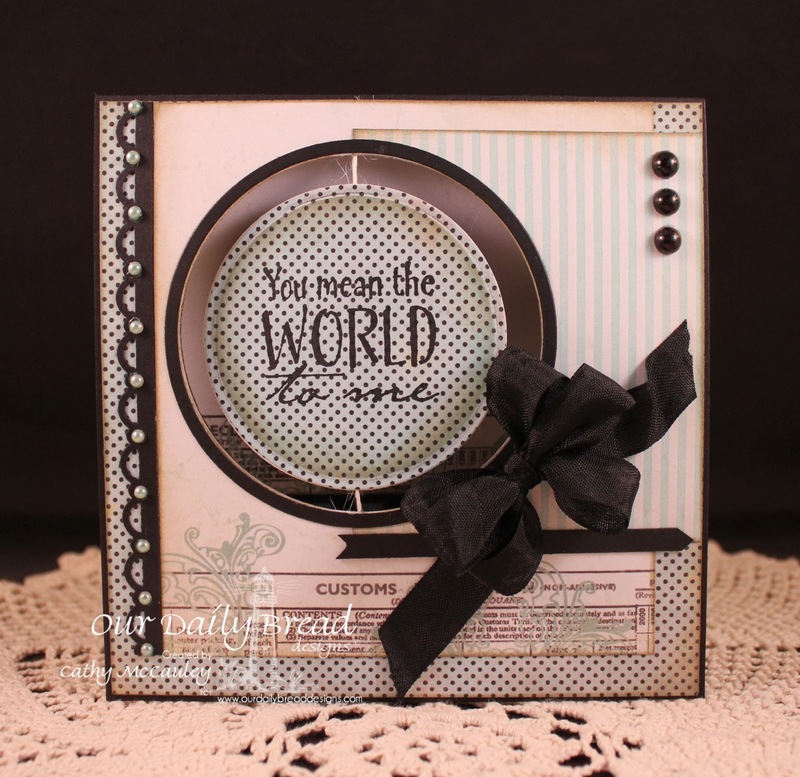 The background, designer paper, and the sentiment panel were stitched to True Black card stock, mounted onto Ocean Tides, and attached to a Solar Crest card base. The Earth was mounted on the front of the card with foam tape. 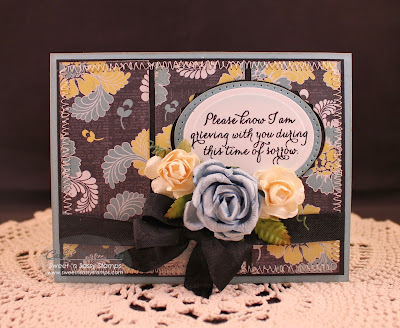 A bit of Antique Border made with a scrap of the background paper was added along with some pearls and a twine bow to finish the card. 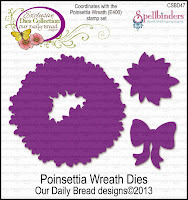 Here is another card using the Poinsettia Wreath stamp set and the matching Poinsettia Wreath Dies. 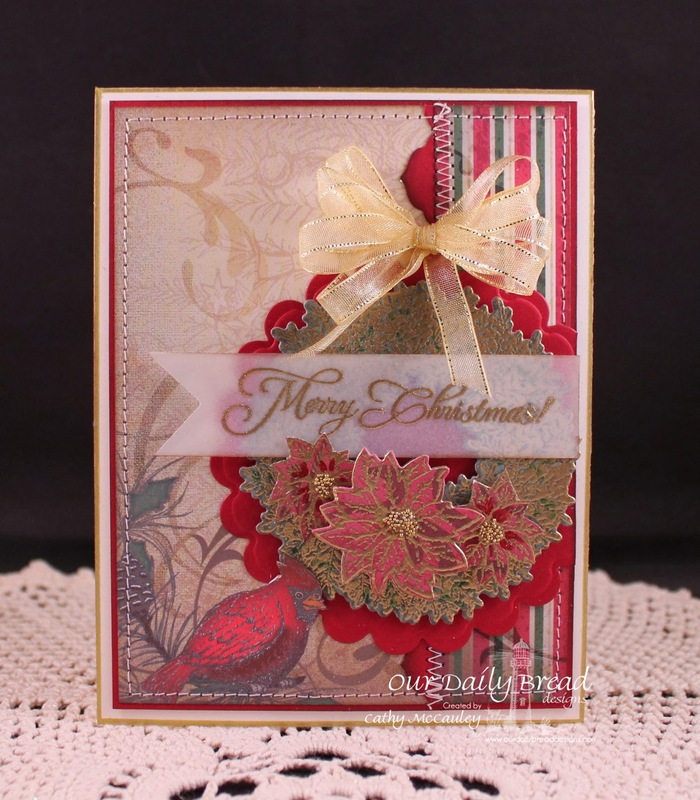 I have been having so much fun with the little poinsettia from this set...it is the perfect accent for Christmas cards. 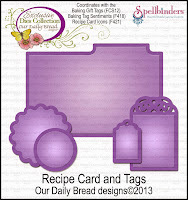 This card was used for the sketch challenge on SCS this week and will also be entered into the Our Daily Bread Designs Shining the Light Challenge (ODBDSLC179) which was to make a holiday card (Thanksgiving or Christmas)...perfect for this time of year! 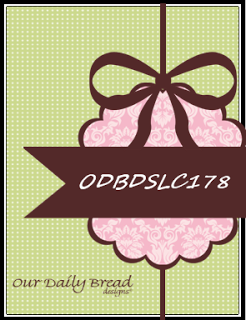 For more inspiration using the November Release be sure to visit the ODBD Blog. hope you've been inspired by your visit! Have a wonderful day! Hello friends! 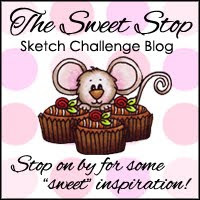 I have a quick card to share with you that was made for two challenges... the Ways to Use It Challenge on Splitcoaststampers was to use a wreath on your card or project, and the sketch from the Shining the Light Challenge on the Our Daily Bread Designs Blog was used for the design. 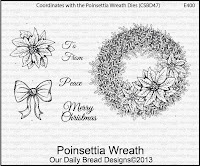 Creative Nugget: Nothing is as warm and inviting as a wreath on the door, and with Christmas just a few weeks away, I reached for this pretty Poinsettia Wreath just released by Our Daily Bread Designs this month. 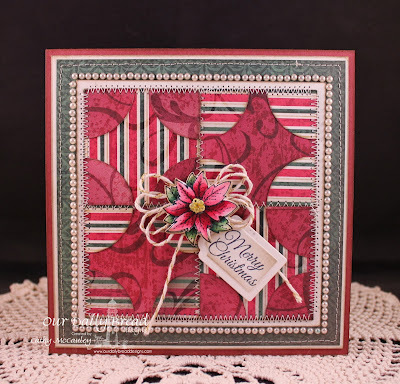 The front of the card was made by stitching an Antique Border Die to some of the pretty papers from the Christmas Paper Collection 2013 and Cherry Cobbler card stock. This panel was mounted on a Vintage Cream card base and a gold pen was used to make a border around the card. 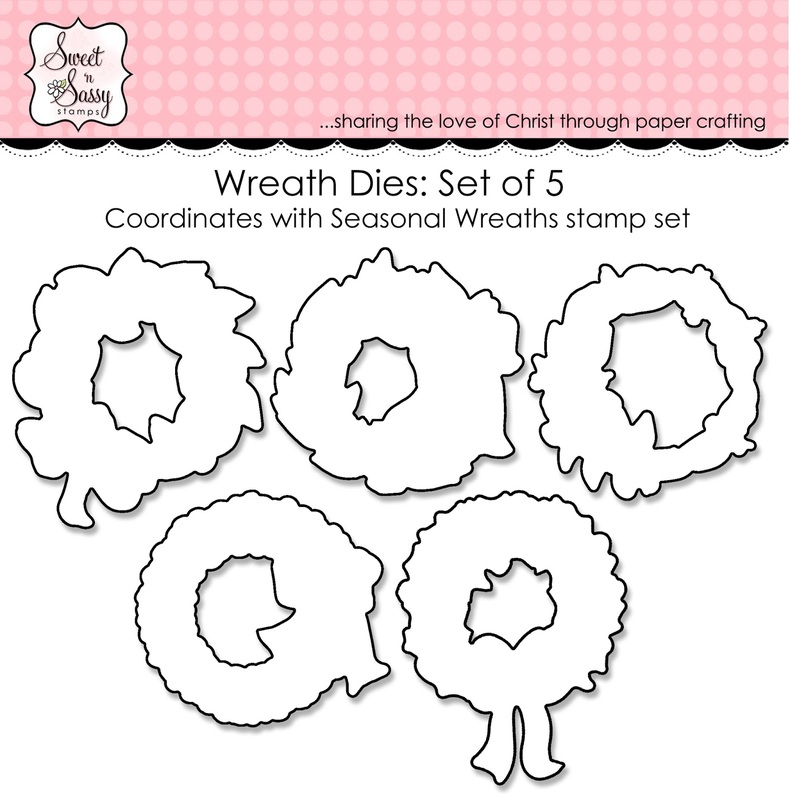 Both the wreath and the poinsettias were gold embossed on some of the other papers from the paper collection and cut with the matching Poinsettia Wreath Dies. The head of the cardinal on the DP was slit to allow the wreath mounted on a Spellbinders Scalloped Circle Die to be tucked under. The sentiment from the Gift of God set was gold embossed on vellum and a gold loopy bow was added to finish the card. Thank you so much for stopping by...have a blessed Sunday! 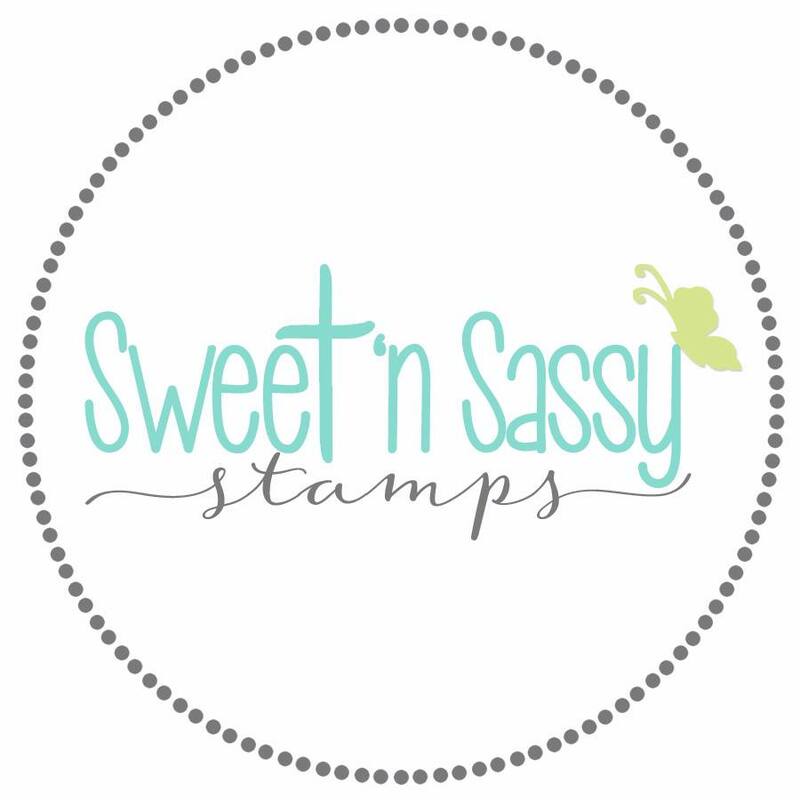 Welcome back to Day 6 and the final day of Sweet 'n Sassy Stamps Feature Blog Hops for the November Release! 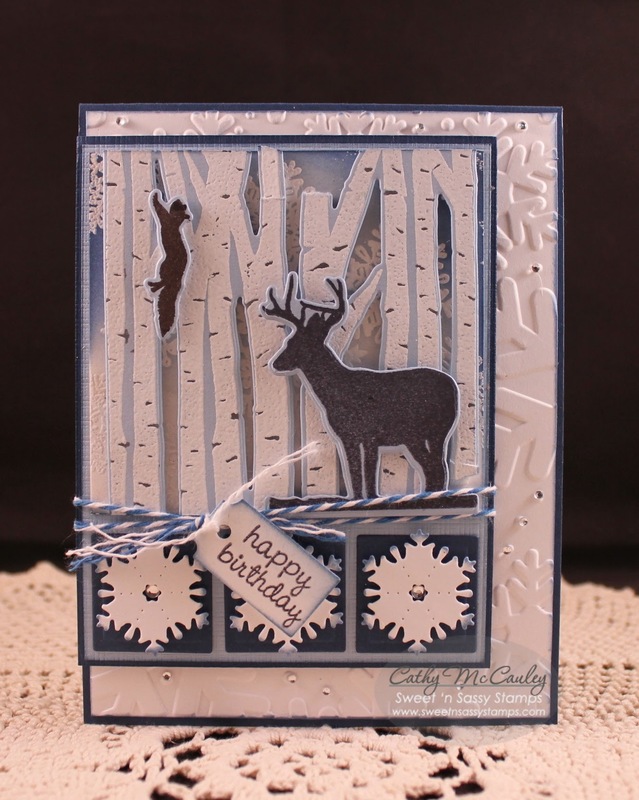 Creative Nugget: Solar Crest card stock was embossed with a Sizzix Snowflake Embossing Folder and attached to an Enchanted Evening card base. Spectacular Snowflakes were white embossed on another Solar Crest panel and sponged with Summer Sky and Blue Danube Memento inks. 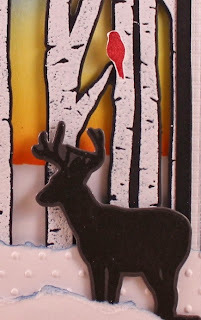 The Birch Forest Die was stamped on Spring Rain card stock, white embossed, and popped up on the sponged panel. 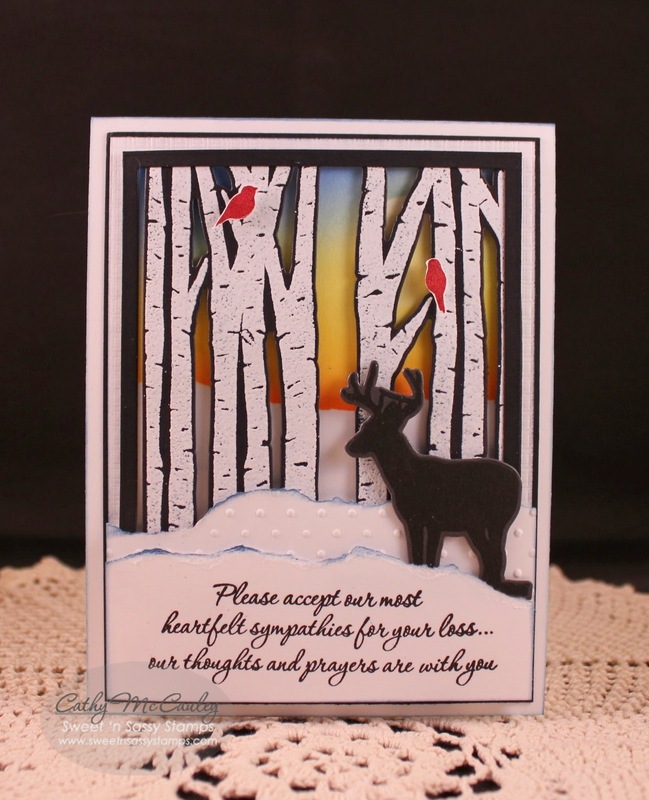 The deer and squirrel dies were cut from Spring Rain, stamped, and popped up on the birch forest. 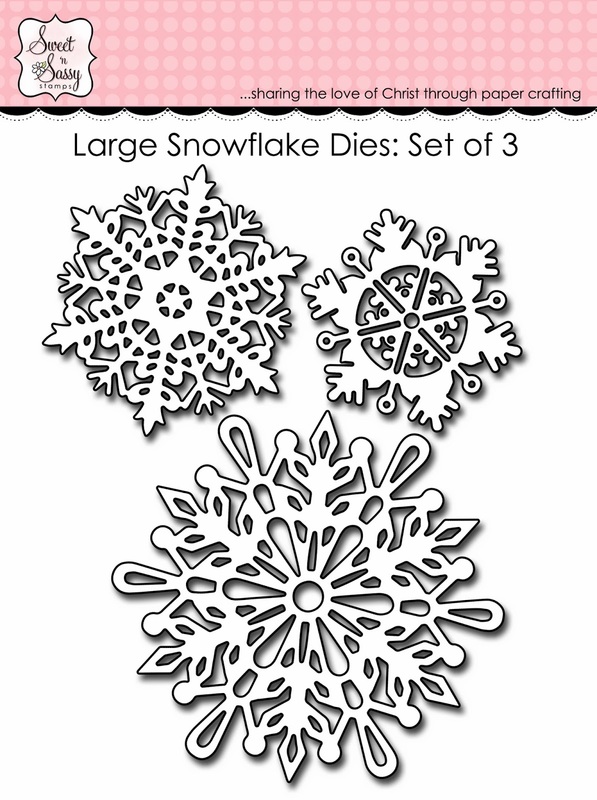 Three Small Snowflake Dies were added to the bottom. A Mini Tag Sentiment was cut with a Mini Tag Die and was added with Baker's Twine along with a scattering of rhinestones to finish the card. Thanks so much for joining us for each of our feature hops! 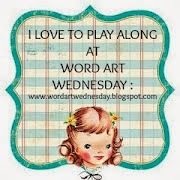 I hope you've been inspired by your visits...have a wonderful day! Welcome back to Day 5 of Sweet 'n Sassy Stamps Feature Blog Hops for the November Release! 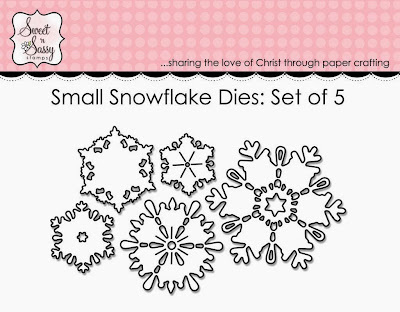 I combined Diane's adorable Snowy Hello set with the Spectacular Snowflakes and Snowflake Die for my sample! 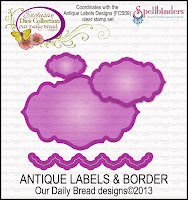 Creative Nugget: The design of this card uses Janette's sketch for today over at Splitcoaststampers. The Bo Bunny DP was stitched to Solar Crest card stock to form the background and was attached to a Spring Rain card front. A canvas impressed Solar Crest panel was stitched to Spring Rain for the second layer. 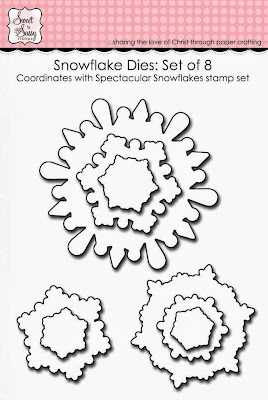 Next came the glittered Spectacular Snowflake Die stamped with the largest of the Spectacular Snowflakes in Bashful Blue ink. 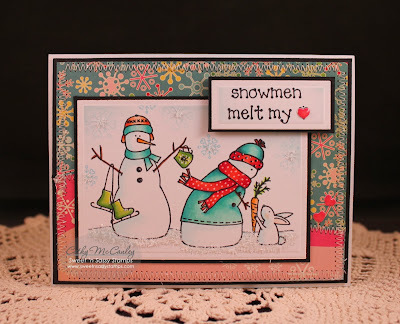 The cute snowman image from Snowy Hello was stamped and colored with Copic Markers. 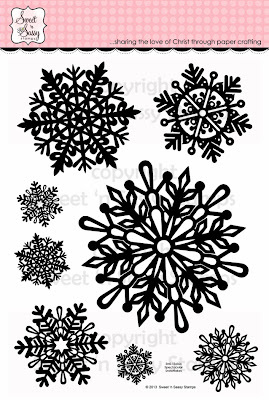 A few of the smaller Spectacular Snowflakes were lightly stamped in the background before cutting the panel with a Square Nestie. The sentiment was stamped on a banner which was folded for dimension. Rhinestones and a bow were added to finish the card. Be sure to leave a comment on each of the blogs along your journey because we're giving away (6) $15 store credits (1 winner will be chosen from each of the 6 blog hops). Thanks so much for joining us! Enjoy the hop! 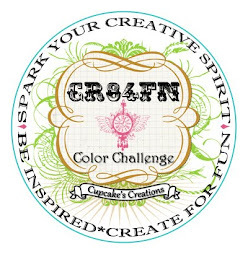 Tomorrow is the last hop for the November Release, so come on back for more fabulous inspiration! Hello friends! Welcome to Day 4 of our November Feature Blog Hops! 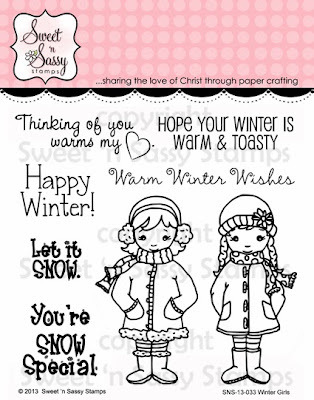 Today we're featuring Korin's precious new Winter Girls stamp set. The girl images measure approximately 1 1/4" x 2 1/2"
Creative Nugget: The background for this card was created by embedding some of the Large and Small Snowflake Dies with a Sizzix Embossing Folder. Two strips of Winter Park papers by Echo Park were stitched to the background. The Winter Girls were colored with Copic Markers, cut with a Spellbinders A2 Matting Basics Die, and matted with Enchanted Evening card stock. Some of the Spectacular Snowflakes were lightly stamped around the girls. 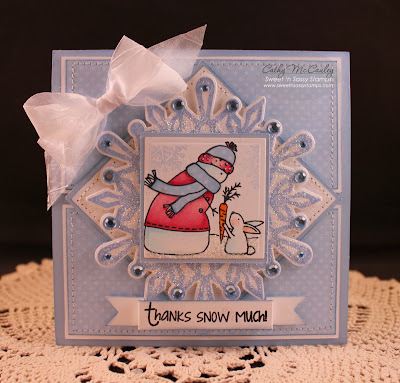 Torn paper snowdrifts were added along with a Small Snowflake Die and a hand cut sentiment banner to finish the card. 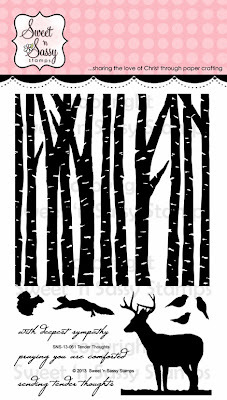 The birch trees measure approximately 3 3/4" X 3 3/4"
The deer measures approximately 1 3/4" x 2"
Here are some samples for your inspiration! 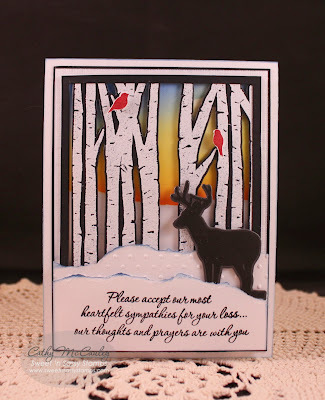 Creative Nugget: I love the new Tender Thoughts stamp set and the Birch Forest Dies! A background was masked and sponged with Memento inks to look like the sun is rising over the snow drifts. The birch forest was cut from True Black card stock and white embossed. The trees can be used as is or they can be separated to accommodate the size of your card as was done here. The trees were popped up with foam tape on the sponged background to create depth. 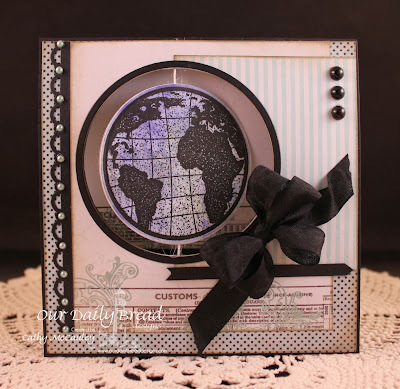 A black frame was cut using Spellbinders A2 Matting Basics dies and attached to the tree panel. Snow drifts were torn from Solar Crest paper...one drift was embossed with Swiss Dots while a sentiment from Sympathy Innies was stamped on the other. These were also attached with foam tape. The deer was cut from Smokey Shadow and stamped with Versafine Onyx Black ink, and a few Cherry Cobbler birds were stamped, hand cut and added to finish this card. Creative Nugget: The pattern for this card came from the Technique Junkies' Designer Paper Perfection CD. The Authentique papers were cut using the directions on the CD. It's hard to see, but the first cut in the DP was made with a Decorative Plaque Die. The panels were loosely stitched (still getting used to the tension on my new sewing machine...I miss my old Sew Mini) to True Black card stock and attached to a Baja Breeze card base. 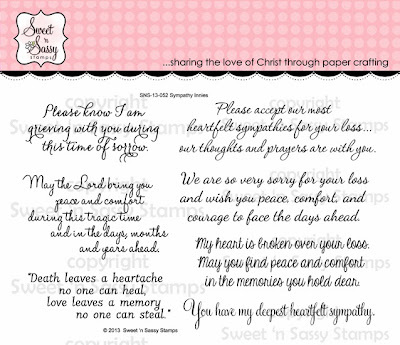 The sentiment, from the new Sympathy Innies stamp set, was stamped, cut and matted to a Baja Breese oval, and attached to the card. A black bow and a few mulberry roses finish the card. Thanks so much for joining us! Enjoy the hop! Check back with us again tomorrow for Day 4. Hello again sweet friends! The days are getting blustery and it won't be long before the skies turn gray and it begins to snow! 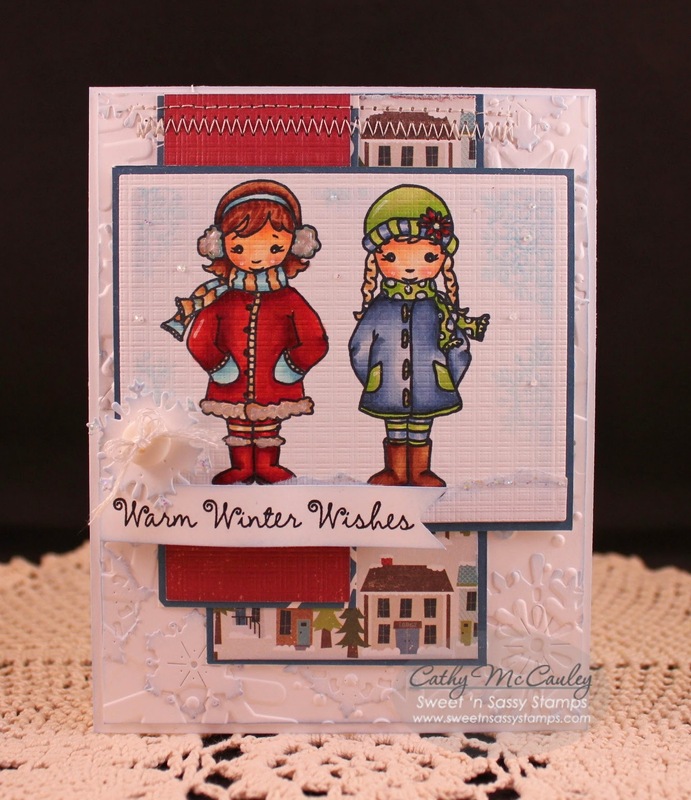 Today's feature Blog Hop will get you ready for those snowy days! Welcome to Day 2 of our November feature Blog Hops! Here is my sample made with Snowy Hello! Creatie Nugget: These snowmen are just so adorable I had to use both images on my sample! They were colored with Copic Markers and a horizon line was drawn with a pigment pen. A few Spectacular Snowflakes were lightly stamped around them and some Martha Stewart Tinsel Glitter was used for the snow on the ground. The image and the sentiment were matted on Basic Black card stock and mounted on some old Cosmo Cricket DP from my stash which was stitched to a Solar Crest card base. Little hearts from the Hearts Scallop Die were added and covered with Glossy Accents to finish the card. Cute! Hello sweet friends...welcome to Day 1 of our November Feature Blog Hops! 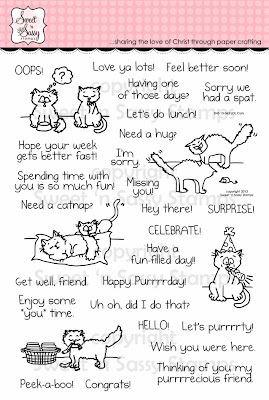 Today we're featuring Korin's new LOL Cats stamp set! it's a GIFT WITH PURCHASE for a limited time! 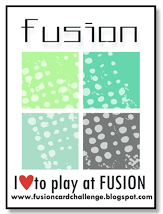 Here is a sample made with this fun set! 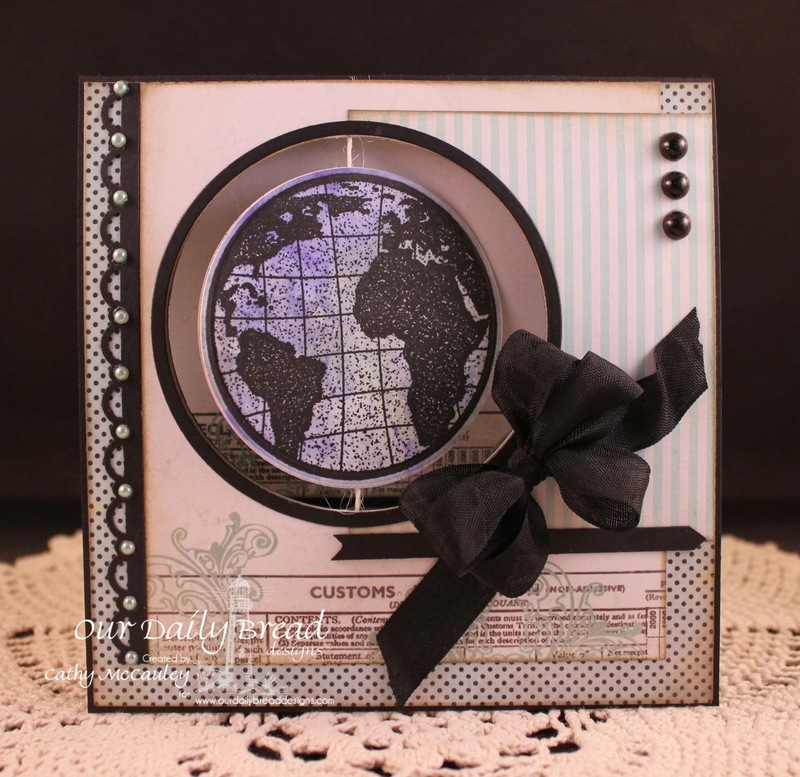 Creative Nugget: A Stair Step card was created with True Black card stock following the directions on THIS TUTORIAL at Splitcoaststampers. Bo Bunny DP was added to each of the steps. 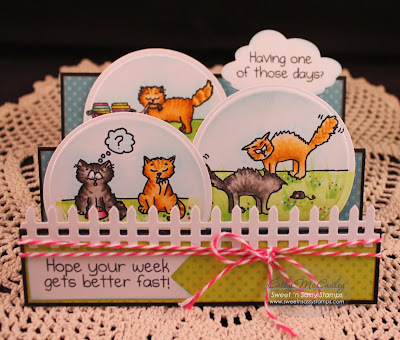 The three images from the LOL Cats set were colored with copic markers and cut with a Spellbinders Circle Nestie. These were then mounted on the steps also. One sentiment was stamped on a Cloud Die and the other on a hand cut banner. 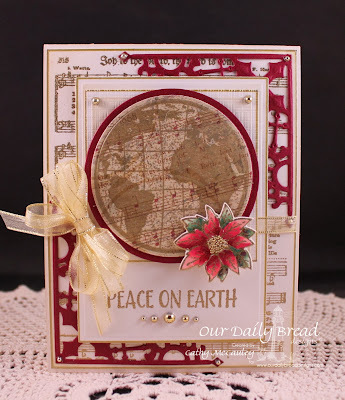 A Fence Die and Bakers Twine finish the card! How cute! Hello friends...hope you are having a good week! I can't believe it's November already...but, since it is, it's time to seriously get those Christmas cards made! 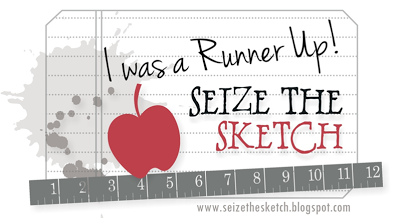 Today I am hosting the Sketch Challenge on Splitcoaststampers and thought I would take the opportunity to get another one finished! Creative Nugget: I just realized that this card is very geometric...each of the basic shapes... circle, square, rectangles, and two triangles are represented! 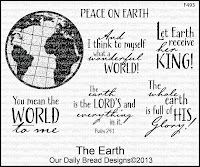 The Earth, a new stamp set by Our Daily Bread Designs, was clear embossed on a sheet of patterned paper in the new Christmas Collection 2013 paper pack. It was cut with a Circle Nestie and matted on Burgandy Kaisercard. The sentiment was gold embossed on the small rectangle layer and the Joy to the World music background was gold embossed on the larger rectangle. Each layer was edged with a gold pigment pen. The little poinsettia from the new Poinsettia Wreath stamp set was gold embossed, colored with Copic Markers, and cut with the matching Poinsettia Wreath Die. Gold micro beads were added to the center of the flower. 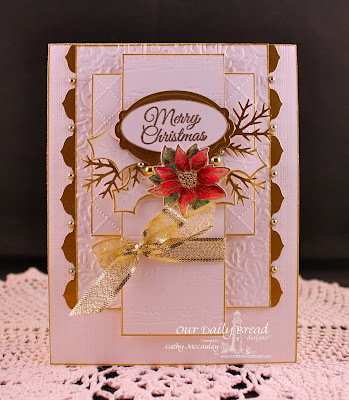 The burgandy Decorative Corners Dies, gold pearls, and a gold bow finish the card. Hello Friends! 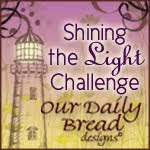 Welcome to the Our Daily Bread Designs November Release! Five stamp sets, three mini backgrounds, and two new die sets perfect for your Christmas card making are being released today! 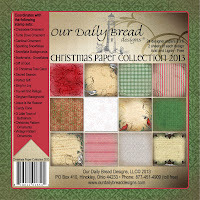 You can see all of the wonderful samples created by the talented design team with this month's new release on the Our Daily Bread Designs Blog. 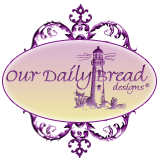 One winner will be randomly chosen from one of the designers blog comments to receive a $50 Gift Certificate to the ODBD Store to be used toward the purchase of ODBD stamps. 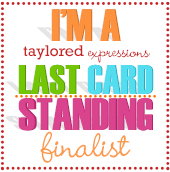 You have until November 2, 2013 at 9:00 p.m. EST to make your comments! The winner will be posted on the ODBD Blog on November 3rd, so be sure to check back there to see if you won! 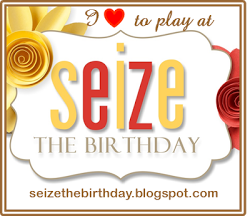 I have two samples to share with you today. My first sample uses The Earth stamp set. Not only can this set be used for Christmas, depending on the sentiment and colors used, but as used here, an expression of appreciation. 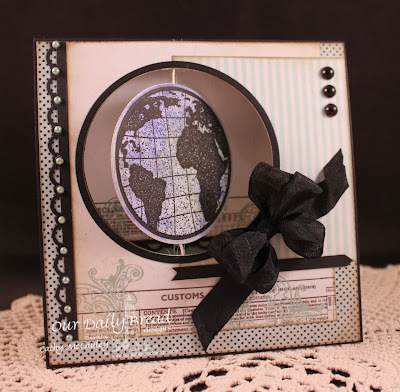 Creative Nugget: I decided to make a Floating Spinner card so the earth could spin to reveal The Earth image on one side and a sentiment from the set on the other. The front of the card and the inside are decorated with Authentique papers, a scallop punched border, ribbon, and pearls. The directions for the card can be found on the Fancy Folds & Motion Paper Crafts CD by Technique Junkies. This photo shows the other side of the spinner. And this photo shows the spinning mechanism a little better. For my second sample, I used the new Poinsettia Wreath stamp set and some of the gorgeous new Christmas Paper Collection 2013 papers. 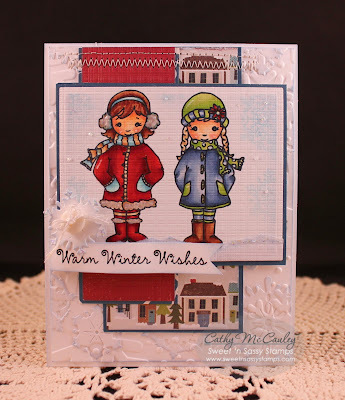 Creative Nugget: The front of the card uses some of the beautiful papers from the Christmas Paper Collection 2013 arranged in a quilt pattern. The papers were stitched to Rustic White card stock and mounted to a Cranberry Crisp card base. 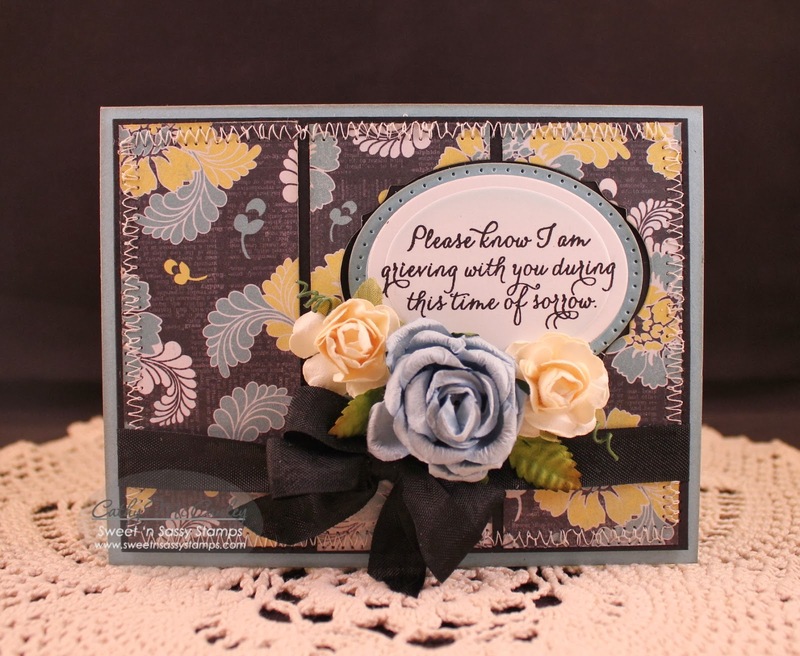 Pearls were placed around the central panel to add a bit of elegance to the card. My intension was to use the Poinsettia Wreath in the center of the card, but it covered up too much of the pretty quilt pattern, so I settled for the small poinsettia which was also part of the set. The little poinsettia was cut with the matching Poinsettia Die, colored with Copic Markers, and popped onto a bow made from Bakers Twine. Seed beads were colored with a Copic Marker and glued to the center of the flower, and the sentiment, on a tag cut with the Recipe Card & Tags Die, was sponged and attached to finish the card. Be sure to check out the other fabulous samples created by the talented Breadstick Design Team and leave a comment to be eligible for the PRIZE! 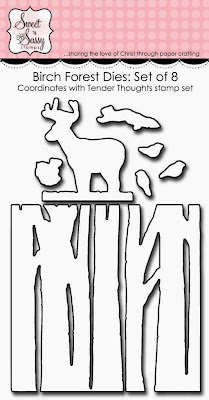 The links to their blogs can be found below for your convenience. Have a wonderful first day of November!